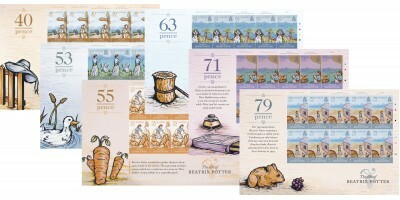 Stamps Descriptions 40p - Beatrix Potter in her childhood. 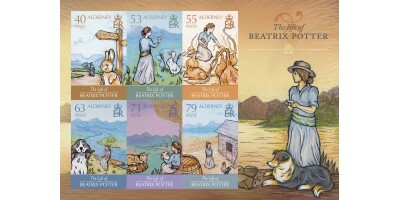 The dog in the image is based on a springer spaniel called 'Spot'.53p - Beatrix Potter enjoyed walking in the countryside around her hometow..
Beatrix Potter is one of the world's best-loved children's authors. 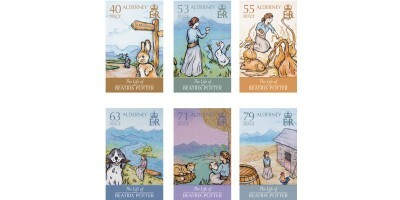 She wrote and illustrated many wonderful books with unique animal characters full of personality such as Peter Rabbit, Benjamin Bunny and Jemima Puddleduck. We are delighted to have created a very special issue to celebrate her life. 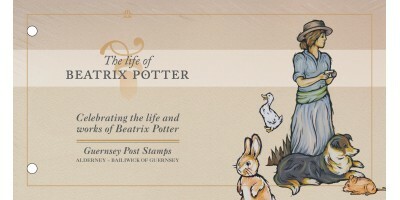 Jay Almer, Managing Director of Guernsey based design agency, The Potting Shed was already familiar with the stories and characters of Potter, like many of us he grew up reading her books, and drinking from Peter Rabbit mugs! He was always totally captivated and inspired by the beauty of the illustrations. Here Jay explains a little bit more about how The Potting Shed set about designing the stunning materials for this issue. "The research element of a project like this is crucial. It allows the designer to gather a mental picture based around the facts of the subject. 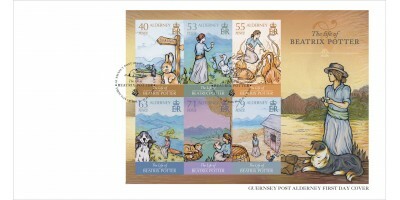 For example, the first stamp composition that we came up with, that which inspired the whole concept, was the 40p stamp of Beatrix walking down the road towards her village of Near Sawry. We imagined her returning to the village after one of her inspiring walks in the Lake District and illustrated this with the rabbit looking up from the grass below the sign-post. My favourite stamp in the set is the 55p stamp, showing the mouse in the onion patch with Beatrix kneeling on the ground pulling up onions. I love the low down perspective - peering through the vegetable patch- and the fact that the background fades to nothing leaving the imagination to fill in the gaps. 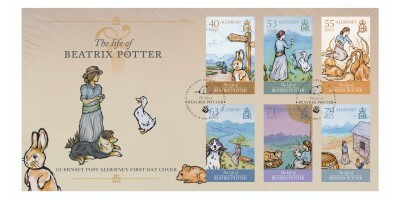 We thoroughly enjoyed illustrating all of the stamps but I think this is the best of the set."